Semarchy was excited to be at the MDM DG event in New York for the 5th time. This year we were a Platinum Sponsor and we were glad to host a dinner with respected analysts Aaron Zornes. We enjoyed chatting with over 200 attendees about our Intelligent Data Hub. Most of them have attended an outstanding session from IMA Financial and learned from Michelle Vercellino's experience in rolling-out an Enterprise hub for financial data. Missed the IMA Financial Session? You’ve built a beautiful dashboard, understand meaningful KPIs, and have the executive team eating from your hand with enticing data visualization. It’s a great start; but does the underlying manual integration work, copies of data, and weaker-than-you-would like SLAs keep you up at night? Michelle Vercellino, Chief Information Officer from IMA Financial discusses how her organization pulled together 96 loose applications and legacy systems to support the business with a meaningful master data and governance framework that has paid big dividends. Michelle is the Chief Technology Officer & Chief Information Officer for The IMA Financial Group, Inc., leading the company in enabling innovative business solutions through supporting technologies and partnering with The IMA Financial Group’s business units and subsidiaries to facilitate growth, scalability and operational efficiencies. Thank you to the 40 participants that joined us for dinner and got a chance to network and share with their peers. Thank you to respected analyst Aaron Zornes for his outstanding insights at the dinner. We all had a great time and great food. You can access more of our resources from our main menu. Here is some relevant content to get you started. When considering a data hub project, organizations quickly face the challenge of evaluating ROI and value in order to gain executive sponsorship. Sponsors frequently perceive such projects as risky and time-consuming with low chances of success. They require convincing with solid facts. Semarchy is the Intelligent Data Hub™ company. Our xDM platform solves for enterprise master, reference, as well as Collaborative Data Governance challenges at some of the most well-known brands across the US and Europe. Semarchy is happy to provide you with the most up-to-date datasheets about our products and services. 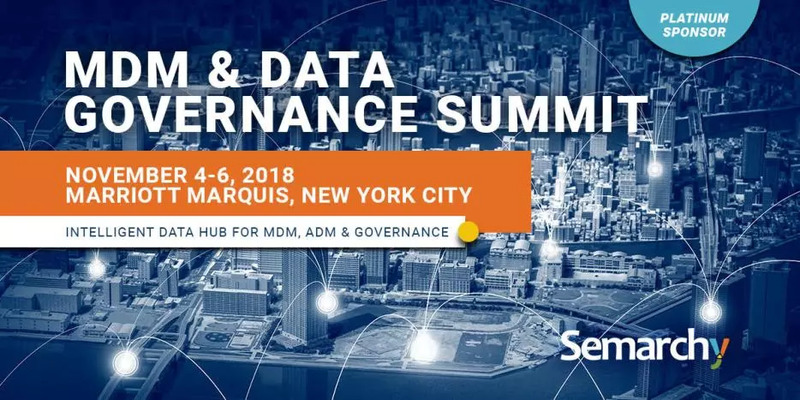 The MDM & Data Governance Summit series is the most widely attended IT event focused on modern data management business and IT issues. Over 2.5 days, learn the necessary strategic insight and tactical best practices while networking with like-minded individuals. With a mixture of leading industry analyst trend perspectives, a wide and large array of use cases, market-leading issue-specific sessions and best practice panel discussions, more digital transformation programs get their direction from the MDM & Data Governance Summit than anywhere else.